As the president of Azerbaijan noted at the meeting of the Cabinet of Ministers dedicated to the results of socioeconomic development of 2018 and objectives for the future, Armenia openly conducts “cognac diplomacy”, head of the Department of Foreign Policy Affairs of the Azerbaijani Presidential Administration Hikmat Hajiyev said, Trend reports Jan. 12. Thus, corrupt politicians are being bribed in the European Parliament and in the Parliamentary Assembly of the Council of Europe (PACE), as well as in the legislative bodies of several western countries and these people, using slander and false information, carry out provocations against Azerbaijan in a dirty manner, he said. Hajiyev stressed that the ethics committees of PACE and the European Parliament, as well as the parliaments of several western countries, should conduct investigations exposing the illegal and corrupt activities of politicians and MPs. "Observers of these institutions, who observed the parliamentary elections held in 2017 by criminal regime in Armenia, in the final reports stated that fundamental freedoms were ensured at the elections. In these elections, representatives of the criminal junta regime gained more than 50 percent of the votes and in the last parliamentary elections they failed to collect even five percent of the votes," he said. "Subsequently, the Armenian people shamefully pulled out the criminal junta regime from the political arena. Everything is quite clear: many politicians represented in the above institutions cooperate with the criminal regime of Armenia in exchange for certain material interests, namely, 'cognac diplomacy', participate in election fraud and then present them as 'democratic'," he added. "On what grounds are these people talking about democratic values? Some of these politicians who gave legitimacy to the criminal junta regime with such reports still continue to represent these institutions. What kind of morality can such politicians as the members of the European Parliament Yaroslav Stetina and Frank Engel talk about, who, sitting at the same table with Serzh Sargsyan in Brussels, discussed criminal actions of a political nature, supported the election of a criminal junta regime, illegally visited the occupied Azerbaijani territories? The financial source of Armenia's 'cognac diplomacy' is the criminal money." "Here criminal activities and political lobbying are developing, complementing each other. Large organized criminal groups under the guise of the 'Armenian mafia' were revealed in Europe, including Germany, Spain, the Czech Republic and Belgium. They were engaged not only in criminal activities, but also in political lobbying. Some members of these criminal groups were arrested with diplomatic passports issued by the Armenian Foreign Ministry. 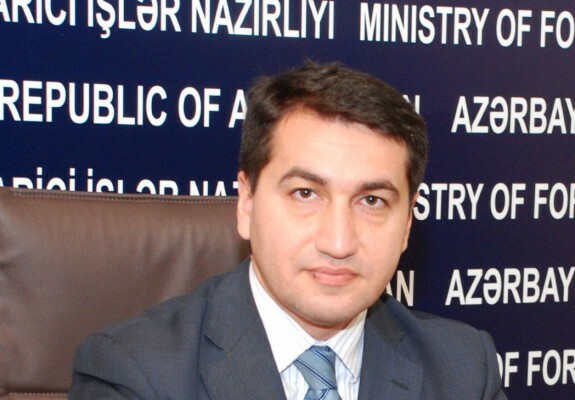 The names of a number of politicians, who are carrying out an anti-Azerbaijani campaign and illegally visit the occupied Azerbaijani territories are mentioned in the criminal case initiated in connection with the Armenian mafia," Hajiyev said.